Minisha's main area of expertise is Conveyancing. She also has experience in Probate, Family Law and Immigration. 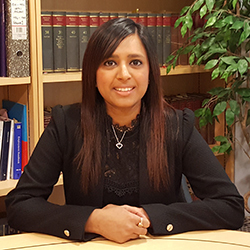 Minisha Patel is a Partner in the Commercial and Residential Property Team and deals with residential and commercial transactions including property purchases and property sales, right to buy, remortgages and lease extensions. Minisha is a motivated conveyancer who will deal with your transaction promptly, efficiently and calmly. She acts for a broad range of clients – private individuals, first time buyers, property developers and high net worth individuals. Her work includes dealing with financing with High Street banks and Bridging Companies. Prior to joining the firm, Minisha completed her Undergraduate and Masters in Law at the University of Hertfordshire. She then went on to complete the Legal Practice Course at the University of Law (Bloomsbury) in March 2015. In her spare time, Minisha likes to keep fit and regularly attends the gym, alongside following sports such as football and cricket.